The Xperia Z5 is finally official, with Sony taking to the stage at IFA 2015 in Berlin to show off its much anticipated flagship smartphone, and it's got company with the Japanese electronics company also unveiling the Xperia Z5 Compact and Z5 Premium. It's been a strange year for Sony as far as flagship smartphone releases are concerned. The firm was widely expected to make a splash with the Xperia Z4 and pit it directly against the likes of the Samsung Galaxy S6, the HTC One M9and the LG G4, and although the Z4 appeared in Japan, the rest of the world has had to make do with the Xperia Z3+ up until now, which isn't much of an upgrade on the Xperia Z3 from last year. This is all set to change with Sony going all out on the Xperia Z5 range, with a host of new and improved features and some genuinely exciting surprises as well. What is it? Three new flagship devices from Sony in the Xperia Z line. Sony Xperia Z5: What is it? 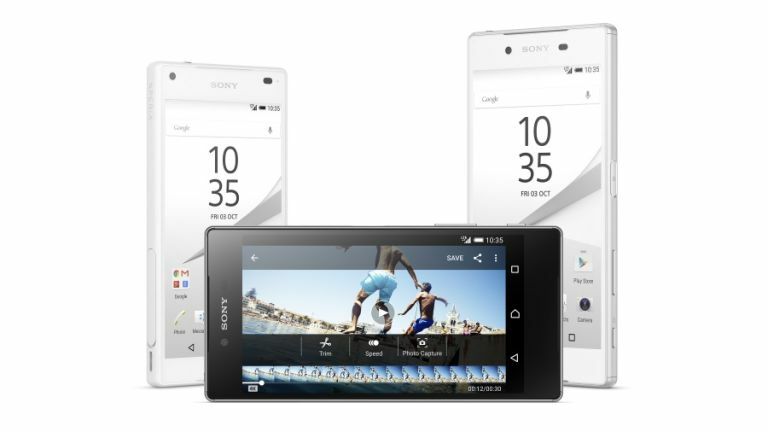 The Sony Xperia Z5 is the latest entrant into Sony's Z line of Xperia handsets. An Xperia Z device is the company's top-of-the-range handset with Sony chucking in the latest and most powerful technology around. With the Sony Xperia Z5 family we have a set of smartphones that Sony has carefully crafted to go head to head with the best handsets in the world, including the iPhone 6 and the Samsung Galaxy S6. Very little expense has been spared, which means although they'll probably end up with pretty high price tags, you'll also know that you'll be buying some of the most powerful and feature-packed smartphones in the world. As with previous versions of Xperia Z handsets, the Xperia Z5 is joined by a smaller version, the Xperia Z5 Compact. While some handset makers cut the specs along with the size of the handset, Sony usually does a great job of keeping its Compact variants similarly powerful to their bigger versions, and the Xperia Z5 Compact continues this trend. For the first time Sony has also released a third variant to coincide with the launches of the Z5 and Z5 Compact with the larger, even more feature packed, Xperia Z5 Premium. At the launch event Sony revealed that we can get our grubby mits on the Xperia Z5 and Z5 Compact from October 2015. The good news is that's not too far away, and the even better news is that it will be a global launch – which means it shouldn't matter where in the world you are, you should be able to nab an Xperia Z5 or Z5 Compact during October. If you're looking forward to the Xperia Z5 Premium then you have a little longer to wait, though thankfully not too much longer, with the bigger handset due to hit stores around the world in November 2015. This extra time will at least give us a few more weeks to save our pennies, as the Xperia Z5 Premium is likely to be a fair bit more expensive than the Xperia Z5 and Z5 Compact. Speaking of prices, what will the damage be if we want to get one of the Xperia Z5 devices? Although Sony splurged a heck of a lot of details about the new Xperia Z5 handsets at its IFA 2015 event, one important detail was conspicuous by its absence: the price. Sony has promised that pricing will be announced in local markets nearer to the launch date, and it also rather ominously states that “pricing will reflect the premium quality of the smartphone”, which in plain English means “prepare your wallets, this is going to be pretty expensive”. We can make an educated guess about what kind of ballpark we're looking at though. The Xperia Z3+ launched at £485, so we'd expect the Z5 to be around that – as long as the Z3+ gets a price cut. As the Z3+ is still reasonably new, Sony might not be planning a price cut, which could put the Z4 above that price. Meanwhile the Xperia Z3 Compact released last year with a £429 asking price, so we'd imagine the Z5 Compact will come at a similar price. The biggest unknown is the Z5 Premium's price, as this is the first “Premium” variant Sony has released. As it comes with a bigger screen with a 4K resolution, it's a pretty safe bet that the Z5 Premium will be the most expensive version, probably around £50 more than the standard Xperia Z5. Ever since the Sony Xperia official Twitter account posted a cryptic tweet that told us to “get ready for a smartphone with greater focus”, we've been expecting an upgrade to the already impressive cameras that Sony has been slapping in its flagship range of Xperias. Happily Sony has made good on its promise, upping the Xperia Z5's camera from 21 megapixels to 23 megapixels, with a 1/2.3 Exmore RS sensor and a F2.0 G Lens. This is Sony's biggest overhaul of its camera module since the Xperia Z1 – proof that it really is going all out with the Xperia Z5 range. Of course a fist full of megapixels isn't enough on its own to provide amazing photos, so it's great to see Sony has also improved the autofocus time of the Xperia Z5's camera, cutting down the time it takes to adjust and take a shot to just 0.03 seconds. This, Sony claims, is the fastest autofocus in a smartphone. Better zooming and 4K video capabilities are also included and the new and improved camera can be found in all three versions of the Sony Xperia Z5. The screen is the biggest differentiator between the Sony Xperia Z5, the Xperia Z5 Compact and the Z5 Premium, with each variant having a unique display. As you'd expect, the Xperia Z5 Compact features the smallest screen, with a 4.6-inch display and a resolution of 720p. This gives the Z5 Compact a pixel density of 323ppi (pixels per inch). Jargon aside, the higher the pixel density a screen has, the sharper and more detailed it is. The Xperia Z5 Compact comes with a 5.2-inch screen that can display at full high definition 1080p, and a density of 428 ppi. This is pretty much identical to the screen found on the Xperia Z3+, which is a bit disappointing. The most impressive display belongs to the Xperia Z5 Premium, which not only boasts the largest screen size at 5.5-inches, but also packs in an incredible 4K resolution, leading to an immense pixel density of 806ppi. This isn't just Sony's first foray into 4K smartphones, but it's the first handset in the world to sport a 3840x2160 resolution display. With upscaling technology that Sony has learnt from its Bravia TV lines, both 4K and high definition footage will look spectacular on the Z5 Premium. As you'd expect from a flagship series, Sony has packed the Xperia Z5 smartphones with some of the most powerful mobile technology in the world today. This means all three devices are powered by top-of-the-range Qualcomm Snapdragon 810 octa-core 64 bit processors, with powerful graphics capabilities that will run even the most demanding games. While the Xperia Z5 Compact comes with a not too shabby 2GB of RAM, the Xperia Z5 and Z5 Premium up their memory to 3GB, allowing these handsets to run Google's latest mobile software, Android 5.1 Lollipop, with ease. The question of how long a smartphone's battery lasts between charges is one of the most important considerations when deciding which expensive blower to lay down some serious cash for, and Sony has been at pains to show that the Xperia Z5 range won't let you down when you're far from a charger. All three of the Xperia Z5 variants are said to have a two day life – which is particularly impressive considering the Z5 Premium's power hungry 4K screen. To keep the Z5 Premium running for up to two days, Sony has included a 3,430 mAh battery pack. The Z5 has a smaller 2,900 mAh battery, but as it only has to power a 1080p screen, it should still be enough. Not surprisingly, the smallest handset, the Z5 Compact, also has the smallest battery with a 2,700 mAh capacity – though its 720p screen shouldn't put too much of a strain on it. As is often the case with stylish – and expensive – phones, the batteries can't be removed and replaced easily.